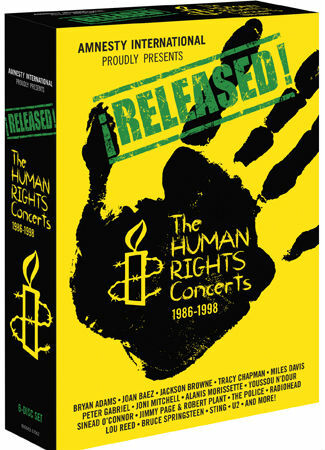 On November 5, Amnesty International will issue !RELEASED!, a six-disc DVD box-set and two-disc companion CD of the historic Human Rights Concerts, featuring artists like Bruce Springsteen, U2, Radiohead, Jimmy Page and Robert Plant, Joan Baez, Peter Gabriel and more. The set includes four shows from the Human Rights Concerts series (1986-1998): Amnesty’s 25th anniversary tour (1986), The Human Rights Now! World tour (1988), the Chilean concert Embrace of Hope (1990), and Parisian concert The Struggle Continues…, which celebrated the 50th anniversary of the Universal Declaration of Human Rights (1998). The list of musicians who contributed to the concerts includes some of the most influential and well-known artists in the world, united to contribute their talents to bring awareness to Amnesty’s campaign for those whose human rights are abused. Check out the track list for!RELEASED! below. 5½ hours including U2 MLK/Pride, Bad, Sunday Bloody Sunday, Help! • The Police Message In A Bottle, Every Breath You Take, Roxanne, King Of Pain • Peter Gabriel Sledgehammer, Biko, Shock The Monkey • Bryan Adams Straight From The Heart, Run From You, Summer of ‘69 • Joni Mitchell Number One, Hejira • Miles Davis Tutu, Burn • Jackson Browne For Everyman, For America • Joan Baez & Aaron Neville Amazing Grace • Joan Armarading Love And Affection • Lou Reed Rock And Roll, Walk On The Wild Side • Ensemble I Shall Be Released – and 37 more songs! 3 hours including Bruce Springsteen & The E Street Band Born In The USA, I’m On Fire, The River • Sting Don’t Stand So Close To Me, Every Breath You Take • Peter Gabriel In Your Eyes, Biko • Youssou N’Dour The Truth • Tracy Chapman Talkin’ About A Revolution • Ensemble Chimes Of Freedom, Get Up, Stand Up – and 8 more songs! 72 minutes including Sting Little Wing, They Dance Alone • Sinead O’Connor Nothing Compares 2 U • Jackson Browne Lives In The Balance • Peter Gabriel Biko • Wynton Marsalis Jungle Blues – and 4 more songs! 2½ hours including Radiohead Karma Police, Paranoid Android • Bruce Springsteen No Surrender, Born In The USA • Jimmy Page & Robert Plant Babe I’m Gonna Leave You, Rock and Roll • Alanis Morissette Hand In My Pocket, Thank U • Peter Gabriel & Youssou N’Dour Signal To Noise, Shaking The Tree • Tracy Chapman Fast Car, Baby Can I Hold You? – and 16 more songs! Other performers include Bob Geldof • Third World • The Hooters • Peter, Paul & Mary • Steven Van Zandt • Rubén Blades • Howard Jones • The Neville Brothers • Inti-Illimani • New Kids On The Block • Asian Dub Foundation • Kassav’ • Shania Twain • Carlos Santana and Fela Kuti. Proceeds from sales of !RELEASED! will benefit Amnesty International.